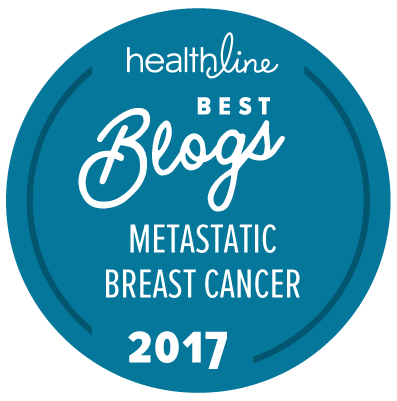 I received a surprise email last week, letting me know I'd been chosen as one of Healthline's Best Metastatic Breast Cancer Blogs of 2015. I didn't even know my blog was being considered! The email went on to say that "Healthline’s editors carefully selected each winner based on quality, frequency of updates and contribution to the community. 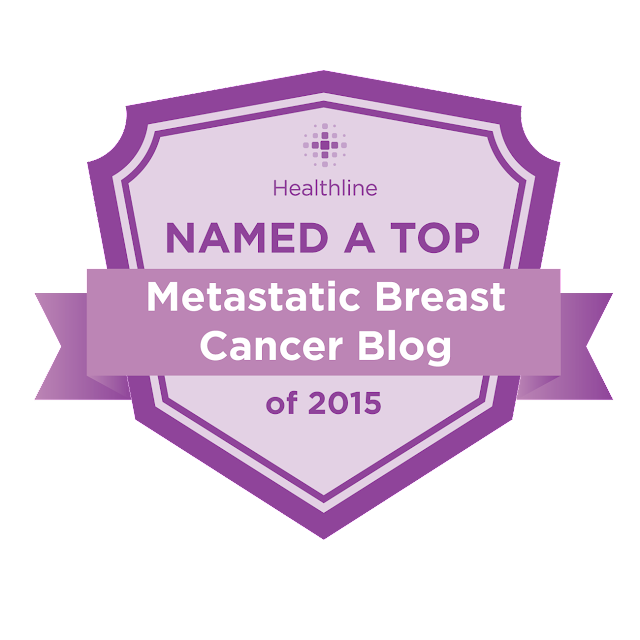 You can see the full list here: http://www.healthline.com/health-slideshow/metastatic-breast-cancer-blogs." I am beyond honored to be included among some of my favorite people in this community. It's a community none of us wanted to be a part of, but here we are writing through our experiences, sharing our hopes and fears, and even advocating for change in the research world. If you're reading this, I encourage you to take a peak at some of the other honorees' sites. These are some badass women. And I do think we're collectively starting to make a difference. People in high places are starting to take note of the plight of those living with metastatic breast cancer. I, for one, can't wait to see the end of MBC as we know it. We're not there yet, but just since my diagnosis four-and-a-half years ago, the average life span is already starting to increase for those with mets. I received this fancy badge to embed on my site, which you may have noticed on the sidebar. I'm humbled, and honored, and so incredibly appreciative of your support -- my readers, friends, and family -- over these past several years. Thank you for keeping me going. Thirteen days after my diagnosis, I started this blog. I started my first round of chemotherapy (Taxotere, Carboplatin, and Herceptin) the next morning. I was scared out of my mind, but eager to eradicate this beast inside of me. Initially, I intended my blog to be a means of communication when medical information was seeming to come in at warp speed. A good friend suggested it, and I thought it would be easier than sending the same email to concerned friends and family a hundred times over. I never expected my little space on the Internet to blossom into what it has become, a therapeutic outlet for me that has also embedded me in a powerful community of thrivers and advocates, moms and can't-be-moms, daughters, sisters, and wives. I didn't expect I'd have my heart broken so many times. I didn't even really expect to still be here nearly five years later. I didn't expect that I'd have strangers reach out to connect with me through the ether to tell me their stories and say thanks for sharing mine. Words have so much power. Thank you for reading mine. Turning lemons into lemonade. Well deserved. Wish you would write more, but you might be just a tiny bit busy. You are awesome! You deserve it, thank you for being you!